I love everything about today's card. I used Impression Obsession, Pine Tree Cover-A-Card stamp and the sentiment stamp is from Hero Arts Merry Christmas Messages. 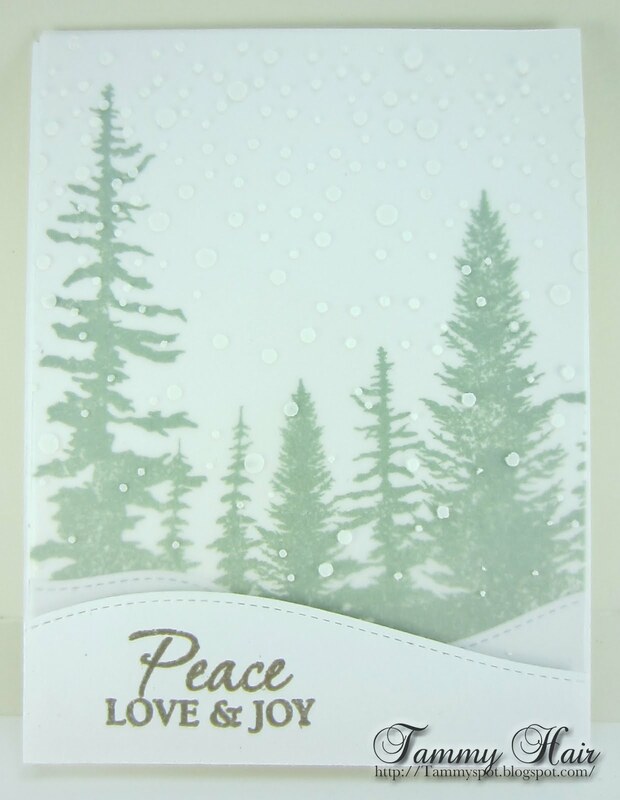 I used a snow stencil on the vellum which give it a sense of quiet peace. I love everything about this card too Tammy! WOW! It looks like a perfect winter day. Simply beautiful plus!!! BEAUTIFUL Tammy...so peaceful and very elegant..
How amazing is this one! A perfect winter snowy scene! Gorgeous! Snow looks so beautiful on a card. It even looks pretty outside a window....but when you have to go out it in, or shovel it, or freeze in it...well, that's a different story. Oh. My. Gosh! So gorgeous! Brilliant idea to overlay the vellum with the snow. Beautiful stamp. Love the snowy landscape in the foreground with the sentiment. Just WOW!